In the context of the fourth revolution, the digital revolution, which is expected to have a dramatic impact on the investment industry, four prominent academic institutions renowned for the quality and relevance of their educational and research programmes in finance and technology – EDHEC-Risk Institute, KAIST, Princeton and Tsinghua Universities – have joined forces. Together, they have been hosting a series of rotational conferences on financial technologies to offer a forum to facilitate discussion among all interested parties (academics, practitioners and regulators) around the world. 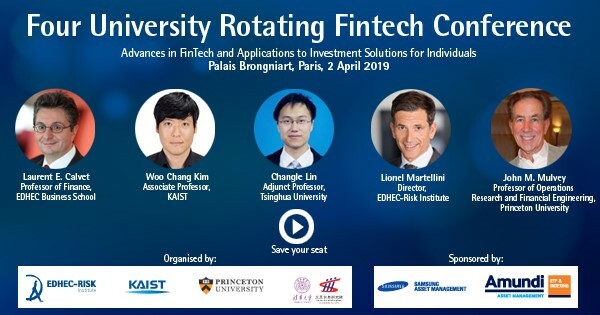 After successful events organised in Princeton in 2017 and Seoul in 2018, EDHEC-Risk Institute is pleased to be hosting the “Advances in Financial Technologies and Applications to Investment Solutions for Individuals” conference to be held in Paris on 2 April 2019, at the Palais Brongniart, which was the historical French Stock Exchange. Roundtable: The Rise of Robo-Advisors: A Threat or an Opportunity for the Wealth Management Industry? To register, please visit https://www.regonline.co.uk/EDHECRiskFintech2019 before March 26, 2019. Registration fee: €150 (special rate at €105 for endorsing partner members, asset owners, EDHEC Alumni). The registration fee includes a buffet lunch, refreshments and conference documentation. Delegates may be refused admission if payment is not received prior to the conference. Accommodation is not included.